[SatNews] Marlink has announced an extension to its VSAT Ku-band service which will now cover sea routes around Australia for the first time. Working with Australian Satellite Communications Pty Ltd, the expanded service will also benefit vessels in the South West and South East Pacific travelling to and from Australia. The new region will be available to Marlink's WaveCall(tm) customers immediately and to Sealink(tm) users during the 2nd quarter of this year. For WaveCall, the network will be using the iDirect Evolution platform, which provides a highly reliable and affordable service with value added services such as Automatic Beam Switching (ABS). This system automatically switches the on board service between satellites to provide a seamless connection with no manual intervention required. ABS is now being implemented by Marlink for all Ku-band regions. 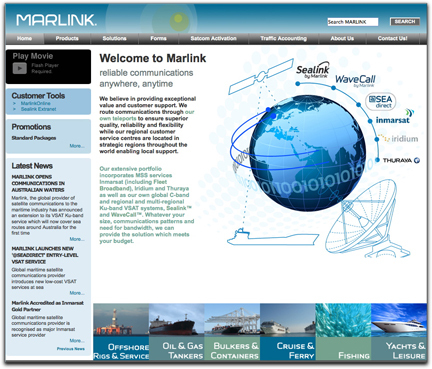 WaveCall is Marlink's own, always-on VSAT system, based on shared Ku-band and used by commercial vessels, fishing boats and large leisure yachts which require a more regional service. Marlink's well established Sealink(tm) global system provides both Ku- and C-band options on an exclusive bandwidth basis. Opening this important new region for Marlink has been made possible by partnering with Australian Satellite Communications Pty Ltd, selected by Marlink as a company equally committed to high quality service for its customers. The extended WaveCall region will be serviced by Marlink's own teleport based in Santa Paula, California, USA. The new region has a greatly increased number of vessels which require satellite communication technology, together with new routes opening for existing Marlink customers. It was therefore important for Marlink to quickly respond to the needs of its customers and provide the service they require. WaveCall uses the latest Sea Tel® Ku-band VSAT antennas, which have been designed for sea going regional and multi-regional vessels that require always-on broadband and provides fast, cost-efficient communications at sea. Marlink acts as one global supplier of maritime VSAT services, with regional customer service centres and support engineers available to provide 24/7 support to customers throughout the world.